1. To make the ganache, bring the cream to the boil over medium heat. Remove from heat, add the chocolate and stir until smooth, then add the honey and stir until combined. Allow to cool completely at room temperature. 2. Preheat the oven to 180°C, gas mark 4. Sift the flour and baking powder three times. Set aside. Place the eggs and the sugar in the bowl of an electric mixer and beat for 8-10 minutes until thick, pale and tripled in volume. Sift the flour over the egg mixture and gently fold through with a metal spoon. Fold through the melted butter. Divide the mixture between 2 lightly greased and lined 20x30cm tins. 3. Bake for 25-30 minutes or until springy to touch. Cool on a wire rack. Spread the ganache over one layer of sponge. Top with the other layer of sponge and refrigerate until cold. Cut into 12 x 6cm squares. 4. Place the icing sugar, cocoa, water and butter into a large bowl and whisk until smooth. 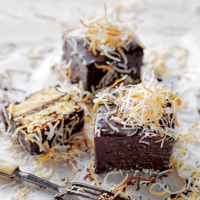 Roll the sponge squares in the icing then sprinkle with the toasted shredded coconut. Place on a wire rack and refrigerate until set.